Are you grateful enough for your life? Find your passion and you’ll wake up every morning full of joy. Amanda Gore is the CEO of The Joy Project, an organization that teaches people to feel good about themselves. She reduces everything to a simple concept: ‘we are still humans’. Despite the rapid pace of change and the incredible progress of technology, the core of it all is: ‘it’s all people’. Amanda points out that no matter what we do in our personal or professional life ‘it’s still about the heart’. People need to feel good about themselves otherwise they lose their joy and don’t find happiness. Joy doesn’t necessarily have to be ecstatic. It can be ‘a sense of inner peace’. Also, we should appreciate every day and be grateful for the beautiful things in life. Expressing our passion will bring us closer to true happiness. Want to work on self-improvement and feel great about yourself? Use this generous resource.Then share it with your friends and spread the passion. Moustafa: Hello everyone and welcome back to Passion Sundays, the best way to end a week and start another! Our guest today is a very interesting speaker who has been speaking for 30 years. She is the CEO of The Joy Project – Amanda Gore! Thank you very much for being with us today! Amanda: You’re welcome! Thank you for inviting me! Moustafa: I’m really excited! I’ve seen you on stage and I’m excited to have you on camera. Amanda: Well, thank you very much! Here I am! Hello! Moustafa: So tell me more about The Joy Project! Amanda: Well, The Joy Project came about because I had written a book called ‘Joy Is an Inside Job’ and people had asked me what’s the difference between happiness and joy. Happiness really is externally dependent so the best description that I could come up with is that happiness is like going on a pitch-black corridor and you’re terrified and you’re desperate to find the light. But you can’t, you’re running into things and it’s overall scary. And you finally find the light switch, you flip it on and go ‘oh, I’m safe, I’m happy (because the lights are on)’. But what you don’t know is that there is someone out there who is ‘Why is this light on?’ and flips the light switch off and suddenly you plunged back into darkness, and fear and unhappiness. However if you stand in that space long enough and breathe in the dark, you’ll find that a glow starts to emerge and the longer you stand there, the brighter the glow is and that’s a glow coming from inside you. And that’s your joy, which you were born with. We coat it in layers of air. Moustafa: I love the joy that you are bringing this out and what’s interesting is that you say it’s more about being in for that joy to come out. Amanda: Joy really is an inside job and that’s why in corporations or in schools where… We’ve got a school where we’re bringing it into and we’ve got profound impact on these students. Because we do this and this is primary school students where in the first term we stop the self-harm. How sad that we have self-harm in primary school. But anyway, we explain the concept so how can they feel better about themselves and how to relate to others heart to heart and how to find feelings because even the little kids are too conscious about how they feel. So we’ve had profound effects in a school and similar things are happening in the workplace as we might have high-tech and everything in organizations. Everything is changing and there is all this new stuff happening but the bottom-line is: it’s all people. And if you don’t have people who are joyful of work or happy at work then nothing really goes. So we forget we are dealing with humans. No matter how sophisticated we are, we are still humans. And it’s still about the heart. Moustafa: I love how genuine you are. I saw you on stage and now it’s really apparent. You’re not coming up with this joy as a façade or as a ‘let’s fake it ’till I make it’, it’s actually you’re starting with the inside and you’re moving with that. That being said, it’s all good when it’s all good. And when the times get tough and life is beating down on you – how do you find that passion and that joy? Amanda: Well, you know there is joy in tragedy because joy isn’t jump out of your skin ‘lalalala that’s great’. It can be real peace and when you feel good about yourself and you feel connected to your purpose, which gives you the passion. And when you feel connected to others and that your life has some kind of meaning, no matter who it means it to, as long as you have some kind of meaning, then there is a sense of inner peace. And that’s really what joy is about. So I remember going through a really tough time not so long ago. Because I’m a speaker on joy but I’m still human and still living a normal life so my life goes like this too. It just maybe I have a few more strategies than others people because I’ve been studying it for so long. And then I have less strategies than other people. Someone wrote to me. She has been through similar experiences and basically it sucked. She felt lost as I did and all the other emotions that were swirling through me. They weren’t all that pleasant. But she reframed it in one sentence and helped me find the joy within that. She said: ‘Remember, you might never get the chance to feel this way again.’ So in some kind of strange way perhaps you can appreciate it in some way and find gratitude for it and gratitude is the single greatest stepping stone and the first stepping stone of the 12 steps to finding joy and inner joy. Moustafa: Gratitude glasses bring joy. Amanda, this has been amazing! Thank you very much, I really appreciate it! Amanda: Thank you! Thanks, Moustafa! Moustafa: What do you think? I would really love to hear your opinion. So if you found this episode as joyful as I did, do share it with your friends and leave your comments on the blog below. And if you’d like more tools, tips, techniques and exclusive videos that I only share on my website, go to Moustafa.com. 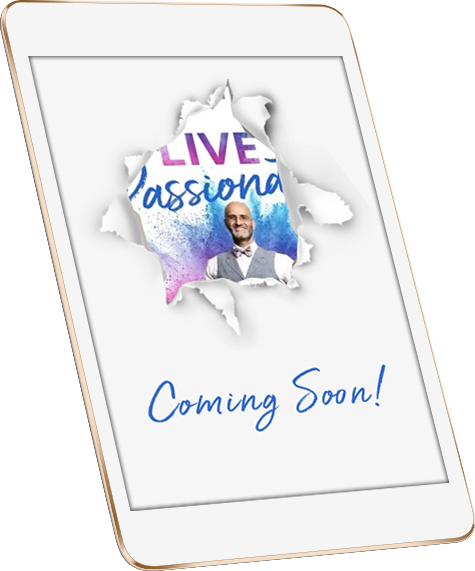 And until next episode – live passionately!